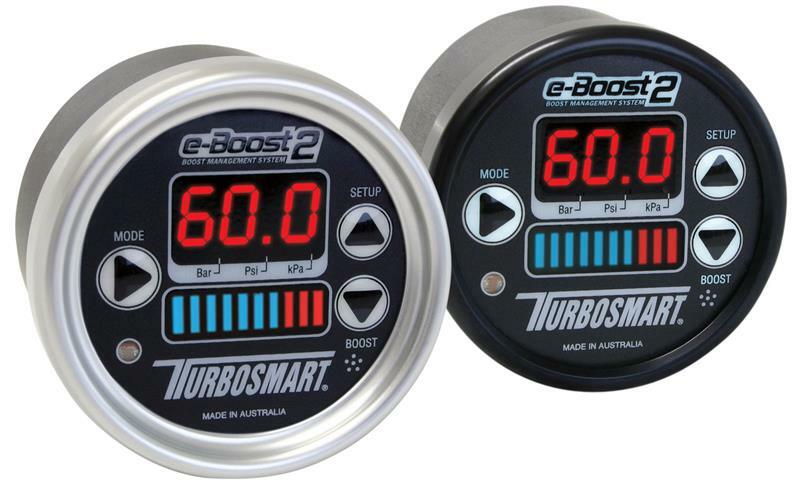 Turbosmart Boost Controllers - e-Boost2 UNIVERSAL - Performance Auto Parts - Car and Truck Accessories | JM Auto Racing - Intensify Your Ride! Boost On Demand feature allows the user to select a boost group for a preset amount of time. An instant overtaking power at a touch of a button! Factory Preset Mode provides beginners with an easy start-up option. Advanced User Mode unlocks up to 6 alternate boost mapping functions. Presets for FWD, RWD, AWD, Bike and Drag racing needs. Gear-based Boost Mapping lets you set a different boost for each gear! Adjustable Boost Levels can also be mapped against TIME or RPM. Peak Hold/Max Boost Recall function monitors boost and RPM. Accurate Display to within +/-0.5% of full scale making it an ideal Boost Gauge!